I have a long and tragic history with plants. For the last two decades, my house has been a barren desert of all things green due to my complete inability to keep anything alive for more than a week. In previous years, I've only had to look sideways at a spider plant for it to crawl off to it's death rather than live in my house. I am incapable of even keeping a potted basil alive. Last Spring, I bought four olive trees from The Range reduced in the Sale to £15 each. These poor plants remain unplanted and have actually died and risen again during the twelve months they've been in my care. But this week, as I gathered my house plants together for their once monthly water, I realised that in the last six months, the mortality rate has risen and at last count, I had twelve real plants that are hanging on in there. It's a miracle of nature. These plants are all STILL ALIVE. Apart from the spider plant. This isn't an inherited lack of skill, btw. My Mum is brilliant at gardening and spends hours creating her mini Kew Gardens in Caversham. Many is the time she's turned up on my doorstep with a hanging basket, beautifully planted for the adornment of my front door, only to return a week later to find it looking as if it's been sprayed with weed killer. And it's not only my side of the family. My step father-in-law Barry is a landscape designer and as I've mentioned before, Clapham's answer to Capability Brown. Barry lives and breathes plants and has always been appalled at my lack of care and attention to anything green. Recently he undertook an urgent mercy mission to rescue the palm tree that was in my courtyard before it reached a point of no return and took it back to London. Whenever he texts, his first question to me is always about how my plants are doing. Our minimalist, plant free, non greenery decking area and courtyard. Note the half dead fir. When we viewed this house, it quickly became apparent that the garden was perfect for me. We don't have a single border. The garden is divided into four lawns, a decking area and two courtyards and all of these are edged with hedging or brick walls. It's a plant lovers worst nightmare but for me, it's a dream. My intentions are always to fill the courtyards with huge potted plants of gorgeousness and turn these areas into lush, tropical, Jungalow style dining spaces. The reality is that Buddy is currently banned from the garden areas after performing The Great Escape a couple of weeks ago and ending up thirty miles away in Driffield. As a result, the courtyards are channelling less Urban Jungle and more Yard Of Poo. Buddy, Dog Of Doom, after his break for freedom last week. What I have realised, however, is that whether you are nature's answer to Alan Titchmarsh or The Grim Reaper, it's possible to bring greenery into your house with very little effort. I've listed below my top six ways of making your home a little less horticulturally challenged at minimum cost. Let's start with the obvious. Recently I was interviewed by another blog about house plants and I have to hold my hands up and confess that I totally asked Dee Campling to answer the questions for me. If you're looking for a feed to follow that knows what they are doing, then Dee is the Charlie Dimmock of Instagram (with a bra) and she's also brilliant at giving advice. Dee Campling, plant expert and very good at bathroom photos. So, as a plant novice/killer, which plants do I have in my home? My most successful to date is a bog standard fern. I've kept it in the kitchen so far with average light and it's been going over a year. I've also got a monstera, a large leaf fig and an aloe vera and in my opinion, I think these are good bets. I have trailing ivy in my kitchen and so far that seems like a winner too. Cacti always pop up as an easy option and I do have a couple of these, but I have also managed to kill off four and once they start to droop phallically, there is no way back. I recently destroyed a huge one that my sister had placed into my care when she moved to Singapore that she'd had for ten years. Large plants don't show the dying off bits as much as small plants, a definite bonus. So where can you buy them reasonably? IKEA is a great place to get house plants - Dee bought me a huge palm that is virtually eternal and never seems to droop despite irregular watering. B&Q, The Range and Homebase all have a selection although not extensive. The big supermarkets often have potted plants too. However, if you've got a local independent garden centre, I would try there first. We've got a couple here in York and they've got loads of fab plants, plus much more reasonably priced than you would find in the bigger retailers. Can't be bothered or don't want the hassle of keeping a real plant alive? Faux is BIG in the world of plants. Ever since Abigail Ahern started producing fantastic versions in her shop, people have been turning to faux as a practical and cool option. The same effect without the aggro - how can you go wrong? They're not cheap though, but a good investment if you don't have the time to care for the real thing or worse, are likely to kill the real thing within an hour. I have faux plants in my downstairs loo which are perfect for a windowless space. I love buying eucalyptus but although the smell is fab for about two days, it soon dries up. I've invested in some faux from Country Baskets and it's brilliant - at £3 a stem it's a bargain too and lasts forever. Faux eucalyptus from Country Baskets. Economical and long lasting. 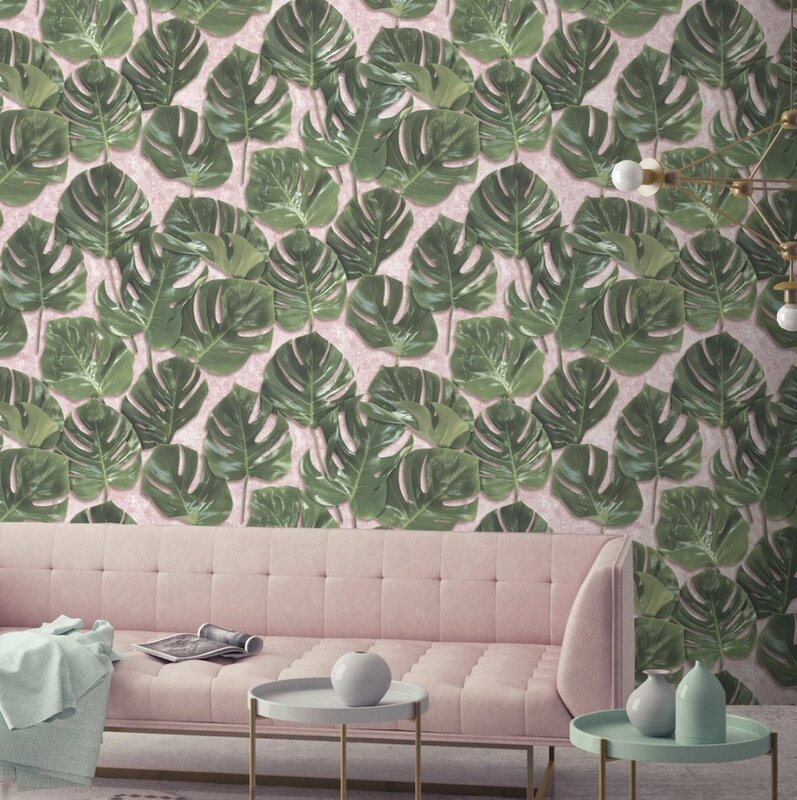 With botanics being the print of the moment, the shops are full of fabulous wallpapers that will bring the outside in to your space. I recently updated my downstairs loo in a Julien Macdonald Honolulu wallpaper which I am super pleased with. It was my first foray into wallpapering myself and it was really easy to put up, barely a swear word passed my lips and it looks pretty professional bar a few dodgy areas where I cut it too short. My first wallpapering win. Don't look too closely. Leo's Oyster Bar - totally inspirational. Photography by The Cool Hunter. Or why not try a wall mural? B&Q have a brilliant forest scene that would make you feel as if you were actually on a woodland walk. Almost like exercising from your sofa, really. Green trees wall mural from B&Q £34. The current botanical trend has been heavily influenced by the Pantone Colour Of The Year, Greenery. Everything from furniture to walls, fabrics to accessories, it's everywhere. The shops are full of the most amazing botanical patterns and prints and it's easy to introduce into your home simply by adding a couple of key pieces. Cushions and throws will give your home that garden style feel without even having to buy a plant. Perfect for the not so green fingered. Spurred on by my loo wallpaper success, I picked up another botanical House Of Hackneyesque style paper from B&Q to wallpaper inside an upcycled bookcase. Really cheap and effective and, I'm warning you, very addictive. Two easy upcycling projects using Julien Macdonald Honolulu print and B&Q Fern & Flowers print. I've been upcycling my furniture for years and would say I was borderline obsessive. I'm constantly trawling the Community Furniture Warehouse and the charity shops for pieces I can update (often badly, if I'm going to be brutally honest) but it's really satisfying to transform something that is past it's prime into something that can be used again. I interviewed TV recycling guru, Max McMurdo, for my blog a few months ago, who is Brand Ambassador for Frenchic furniture paint and a fellow upcycling obsessive. Frenchic have plenty of cool greens to choose from, plus they are totally eco friendly so worth a try. There's loads of fab prints around at the moment which will bring the greenery theme into your home. Pink and green are a popular combo and give a nod to the trend without having to change your decor. So there you go. I think I've proven that you don't need to be a Plant Queen (or King) to have a little bit of greenery going on in your home. Plus there's plenty of Instagram hashtags for you to use for inspiration. Try jungalowstyle, urbanjunglebloggers and plantsmakepeoplehappy for a serious horticulture fix and some great ideas of how you can incorporate greenery into your own space. So despite numerous set backs, I will persevere in my challenge to keep my house green, even though the odds are heavily stacked against whichever poor, unknowingly-on-a-suicide-mission plants are unlucky enough to pass through my door.